While Calgary’s oil crash has caused economic concerns of late, a happy accident of its boom days is a plethora of new architecture – both public and residential – aimed at reviving its downtown. Hot on the heels of new buildings like the Taylor Institute at the University of Calgary, the latest jewel in the Cowtown crown is the National Music Centre. Part of the East Village development – an attempt at ’Vancouverising’ the car-loving suburban sprawl prairie town with mixed-use walkability – the new home of Calgary’s National Music Centre literally bridges old and new. A shimmering skin of custom glazed terracotta tiles that reads like an acoustic wave bridges the new Studio Bell – at once a performance space, museum, educational facility and recording studio – with the 1905 King Edward Hotel, a heritage building and former home to a legendary blues club. Designed by Portland’s Allied Works Architecture (known for the Seattle Art Museum and the Museum of Arts and Design in New York), the centre, inspired says principal Brad Cloepfil, ’by the light, landscape and geography of the northern prairie’, comprises nine interlocking and subtly curved towers rising five stories high. Spanning more than 181,000 sq ft, including 22,000 sq ft of exhibition galleries, Studio Bell weaves an intriguing narrative of Canadian music. 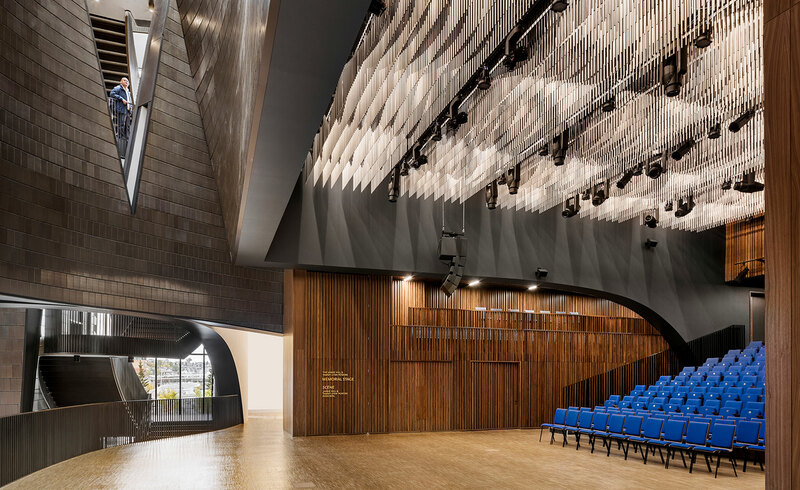 Interlocking arches carve out the ground floor lobby, that opens upward through the centre’s five levels, while the main performance space – a 300 seat hall with a movable acoustic wall – is suspended above. State of the art exhibition galleries are staggered throughout the building – which opens up to vistas of the Bow River and Stampede Park. They are conceived as a series of interactive stages, and are complemented by spaces for contemplation. But it’s the interstitial space between the towers – where two helical staircases on the north and the south flank the lobby – that really wows. The shimmering curved walls resonate with acoustic frisson, amplifying light and sound as if inside the very mind of music.